It is astounding to realize how much of the millions of dollars companies spend to exhibit at trade shows are simply wasted, says New York agency president Lois Geller. She recounts that she saw a product her company could use at a Chicago show. She handed the booth staffer her card. “He put it in a bowl with 200 other business cards,” she recalls. Exhibiting at a trade show, all things considered—charges to rent and equip a booth…personnel to staff it…air fares…hotel rooms…meals—costs thousands of dollars. Yet many businesses fail in the main purpose of taking part in the show: generating qualified leads. Create pre-show impact by highly targeted direct mail to show attendees. Attract booth traffic from potential customers by interesting product news…announcements of premiums or contests for booth visitors…invite prospects to reserve space at scheduled product demonstrations. Design your booth to maximize effective traffic. Plan visitor flow by placing business cards and promotional folders within easy reach at the front of your booth…and encourage in-booth visitors by placing give-aways deep at the rear of your space. Forbid booth staffers to chat with one another—which makes sales prospects think that your booth personnel are too busy to speak with them. Don’t stop with freebies. Giveaways—with the drawing power of something for nothing—are a terrific way to boost booth traffic. But make sure that your booth staffers follow a script that stresses the advantages of buying your products. Follow up prospects quickly after the show. 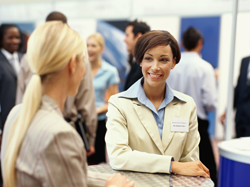 Demand that booth personnel note the subjects of conversations with show visitors. Then make writing personal letters—citing the topics visitors brought up at the show—your #1 post-show priority. And ask for a face-to-face meeting. Never wait weeks or months to write to your prospects. They are busy people and soon will forget what you said at the show.